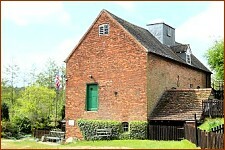 New Hall Mill, a Grade 2 listed building, is one of only two water mills still surviving in the Birmingham area. The Mill and its meadow field are privately owned and managed by the New Hall Water Mill Preservation Trust, Registered Charity No. 502226. Although surrounded by but not part of the New Hall Valley Country Park, the Mill is only open to the general public on specific Open Days, or by prior arrangement. Now restored to a working condition, New Hall Mill is located off Wylde Green Road, Walmley, Sutton Coldfield, in the West Midlands area of central England. It is a significant local example of our industrial heritage and has been described as 'Sutton's little gem'. The present structure dates from the 18th century, although some parts are much older. In the past the mill had two internal waterwheels but now, after rebuilding, the power required to drive the present two pairs of millstones is derived from a single external overshot waterwheel, with most other items of the various milling machinery being powered by a Ruston Hornby diesel engine. A Diagram of the Mill shows the major items of the milling machinery that are in use during Open Days. The Friends of New Hall Mill maintain the Mill in a working condition and operate it during the regular Open Days. Visitors are then able to explore the mill at their own pace to watch the wheat being milled into flour using water power and mill stones in the traditional manner. They can also explore the Cartshed and it's contents, visit 'Auntie Wainwrights' to hunt for a bargain, take a walk around the Miller's Garden, the Mill Meadow with the Wild Flowers, Jubilee Hedge and the Tree Trail, or the small Woodland Walk. Afterwards a visit to the Tea Room can offer a selection of cakes, snacks and hot drinks. Cool drinks and ice-creams are available from the Exhibition and Sales Room. Seating is available outside at picnic tables or inside in poorer weather. Toilets, including a 'disabled' one, are located in the same building.